Still in progress... 3.5 weeks done, 2.5 to go! There you can find all the info about how I booked what. May take some searching in there. Thanks for the installment-PLEASE keep them comin-very enjoyable read!! not many people would bother posting and even writing that long after their trip. Thank you. Aw, shucks. It's fun for me to put this together also. I hope I inspire others to keep on working on their TRs. This was our first non J (or fake J) flight on the trip, but for the 1 hour flight, we were just fine . Before we blinked, we landed. Despite having already looked into which trains to take from the airport to the hotel, it took time getting used to the airport/trains and buying train tickets, so the whole travel took about an hour. For 13.60CHF each (~$15 – finally, a pretty good currency! 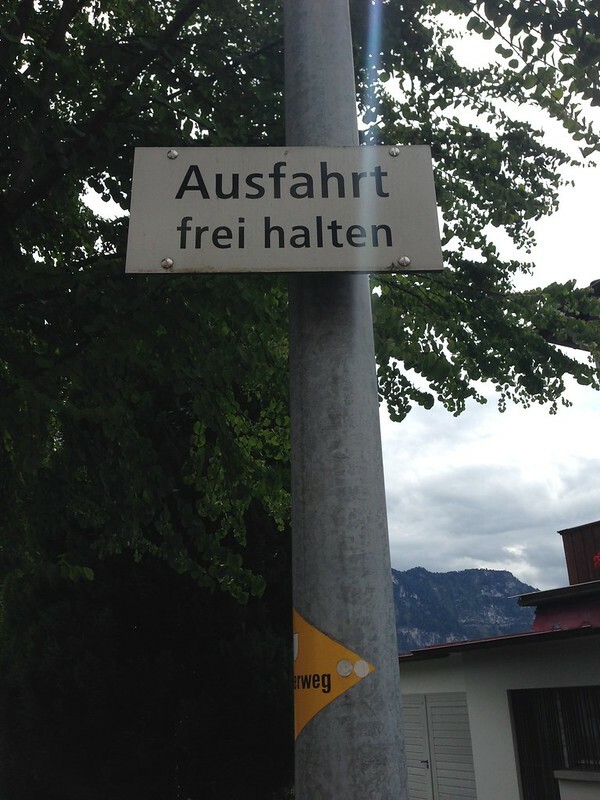 ), we got tickets for the train from the airport to the main Zurich train station (Zurich Hauptbahnhof or Zurich HB) and a tram (basically an above ground subway – nicer than NYC too) from there to the hotel. 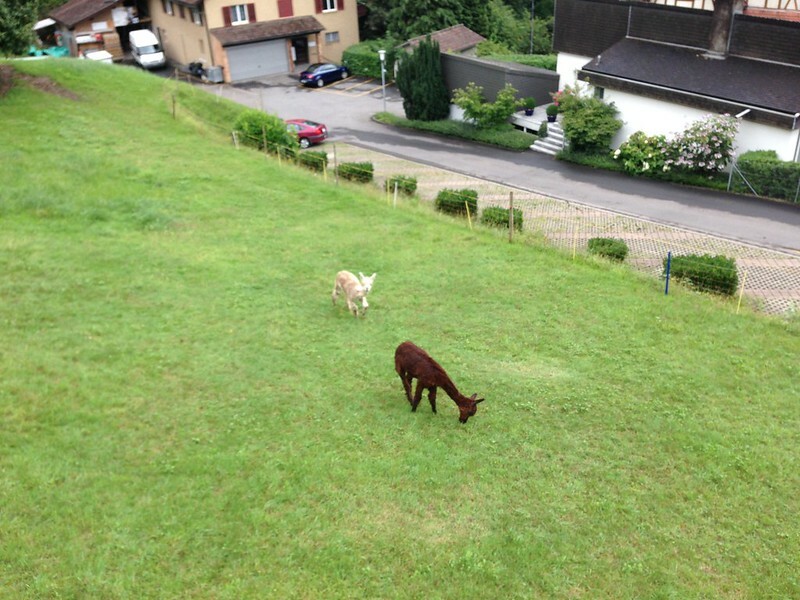 We stayed at the Sheraton Zurich Hotel for 16K SPG and really liked it. The room was really modern and huge. 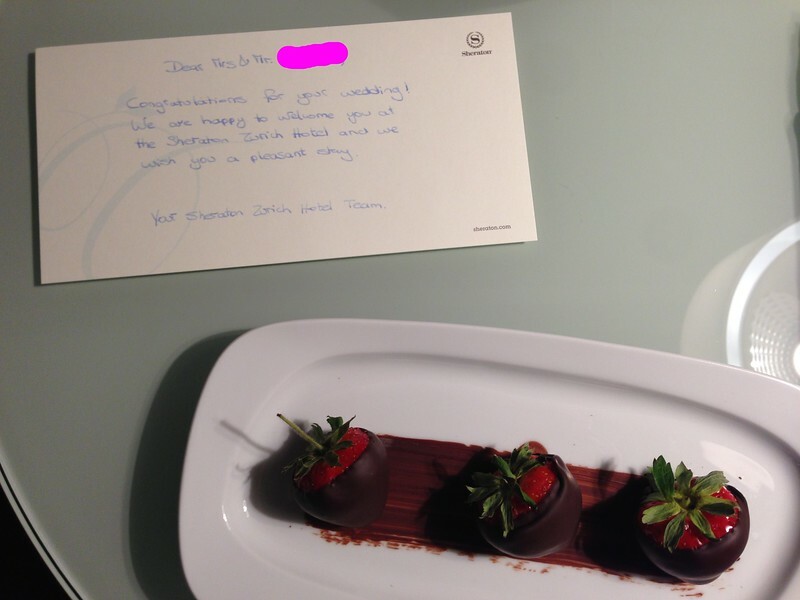 As a honeymoon gift, they left us this nice plate that we, unfortunately, couldn’t eat. In the morning, we packed up, checked out of the hotel and paid $5 in taxes. I had done some research before the trip about which trains would get us around town and to an Alp, but incredibly, a DDFer from Zurich (who was currently living in Israel) reached out to me and offered to get us an all-day travel pass good for the local trams and the long-distance trains. It’s not easy to obtain one of these as they only go on sale 30 days in advance, only a few are made available for each day and can only be purchased by a Zurich resident. He took care of all of that for us and then actually had someone from his hometown get the passes to him in Israel where he met up with us in Yerushalayim one day while we were there. To do so much for someone you don’t know (and refusing to take anything in return) blew our minds. I love DansDeals. The passes cost just under $50 each, but were well worth it once you see how much they covered. We first took the tram to Zurich HB where we stored our bags in a locker for 9CHF and then got on another tram to Agudas Achim for Shacharis (IIRC we had to pass through Zurich HB anyway to get to Shul, so it made sense to drop our stuff in the locker anyway). 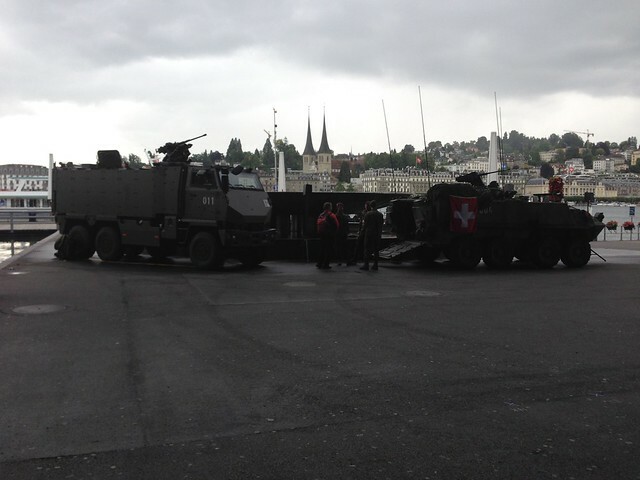 I was caught off guard by how many Jews we saw in the streets – I totally had no idea the Zurich community was so large! Agudas Achim was a Minyan factory (I think), so a new Minyan had been starting when I walked in. After Shul, we went right across the street to the Kosher City Grocery store and were, once again, surprised by how much Kosher food was available. We stocked up on all sorts of food to cover us for breakfast, lunch and dinner for about $50. 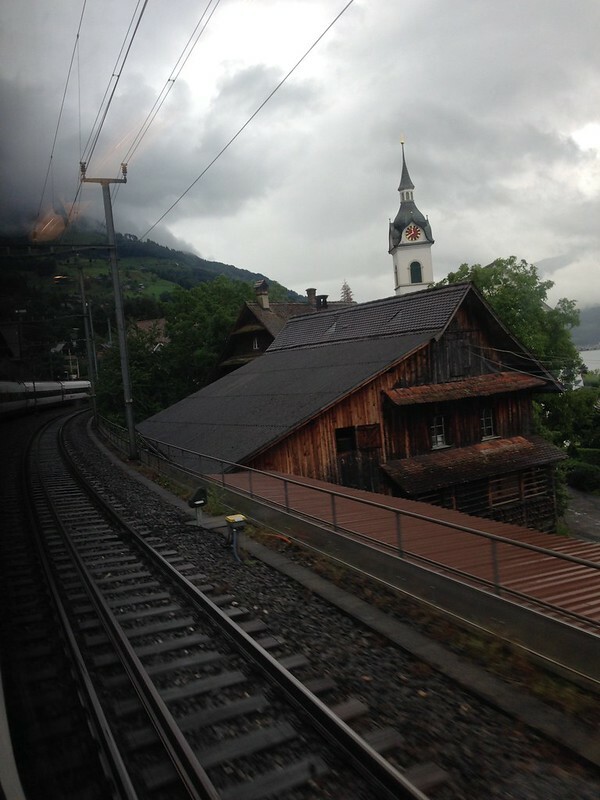 We got on a tram back to Zurich HB and went to our locker to put my Tallis and Tefillin away. As soon as I opened the locker, I realized my mistake. There went our 9CHF for the day’s locker! After paying again to re-lock it, we went to speak with an information agent to decide on the best way to get to the Alps with the specific train pass we had. 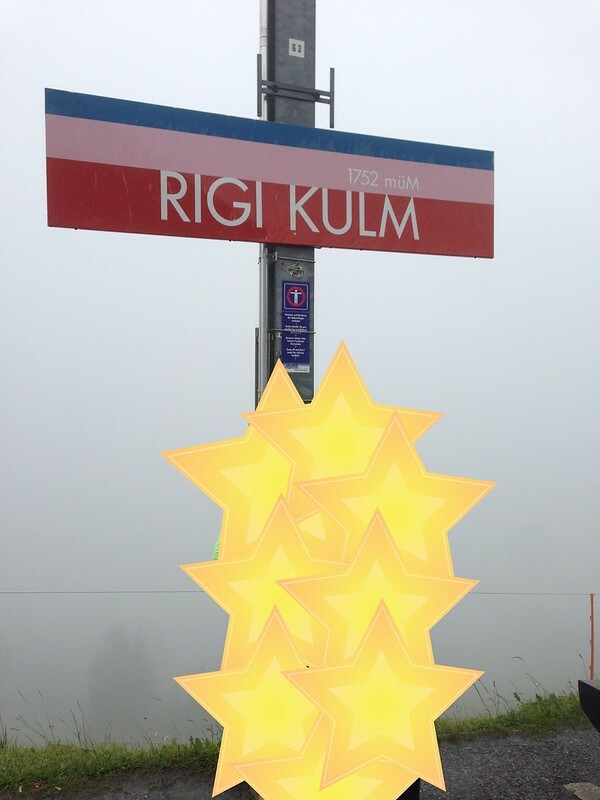 Instead of the classic roundtrip to Lucerne and the (around $100) Golden Ticket up to Mount Pilatus, we opted for trains that would be covered with our pass and decided on Mount Rigi. Unfortunately, this TR is coming so long after we traveled and my notes aren’t so clear, so I'm not positive about our exact route, but it was a day full of train travel with really nice views. 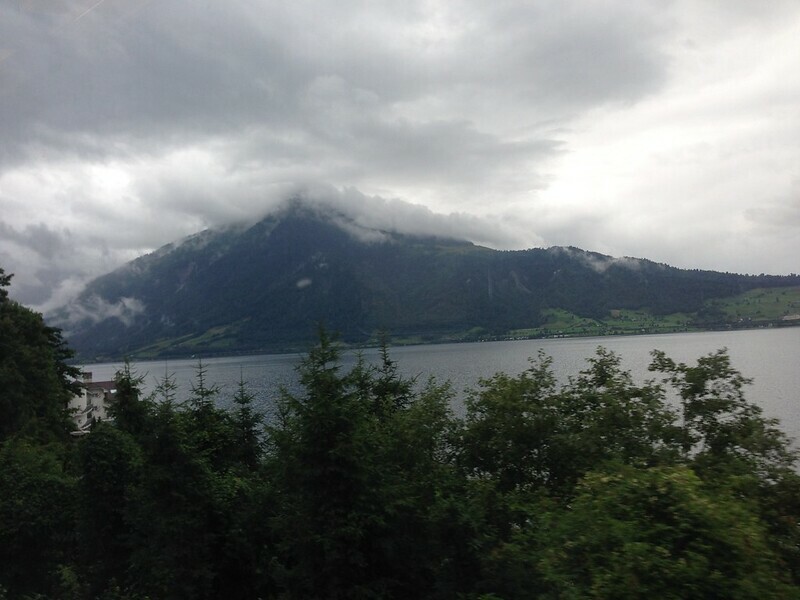 We first took a train to the city of Audi (I believe) where we then took another train to the base of the mountain. It was a cloudy and rainy day, but the buildings/cities we passed were really nice and the mountainous sights were still awe-some. 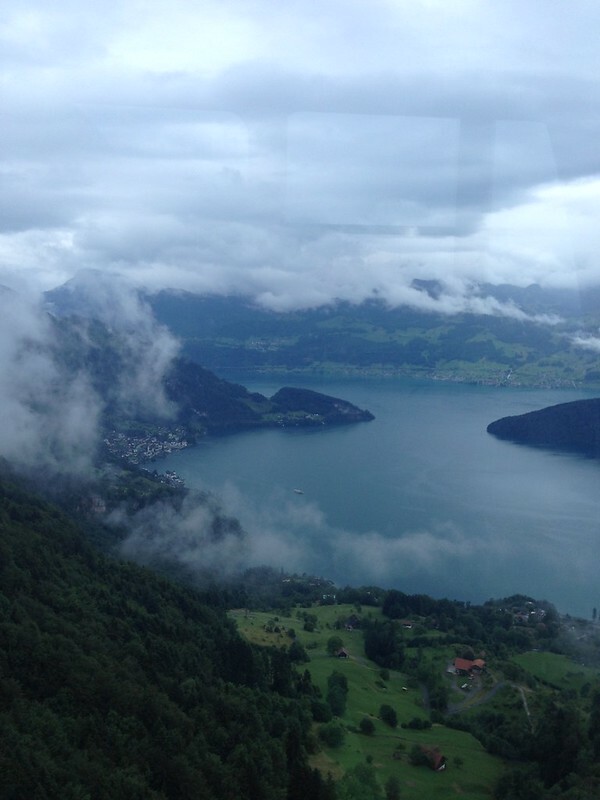 From there, we took a cable car up to the top of Rigi. At times, this train got pretty steep – and boy was it getting colder and wetter by the minute – and as we rode, I read the map of the mountain. The train makes a few stops on its way to the peak, where you can get off and explore or switch train lines to other areas of the mountain. 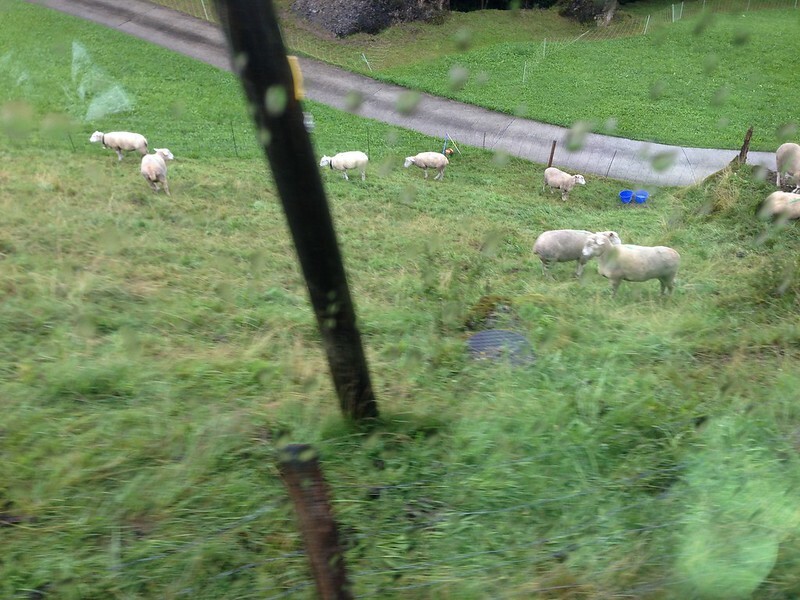 While heading up, our view was still clear, and we saw some sheep chilling in the rain. Once we finally got to the top, though, we were in one, big, FREEZING cloud. You like that effect, eh?? Thankfully it wasn't raining up here, but because you couldn’t see 5 feet infront of you, there wasn’t any point in walking around. Wearing just sweatshirts was not wise, but we also didn’t exactly have coats with us on our summer Eurotrip . We went into the gift shop to warm up for a few minutes before getting back on the train to head down to the next level station below us. At this level, we could see around slightly better and found an information office where we learned about the hiking options in the area, but due to the cold and rainy weather, we opted to just walk around the area nearby. We came across the Mineralbad & Spa which was totally unexpected up here on the mountain, but we left once we found out the prices. 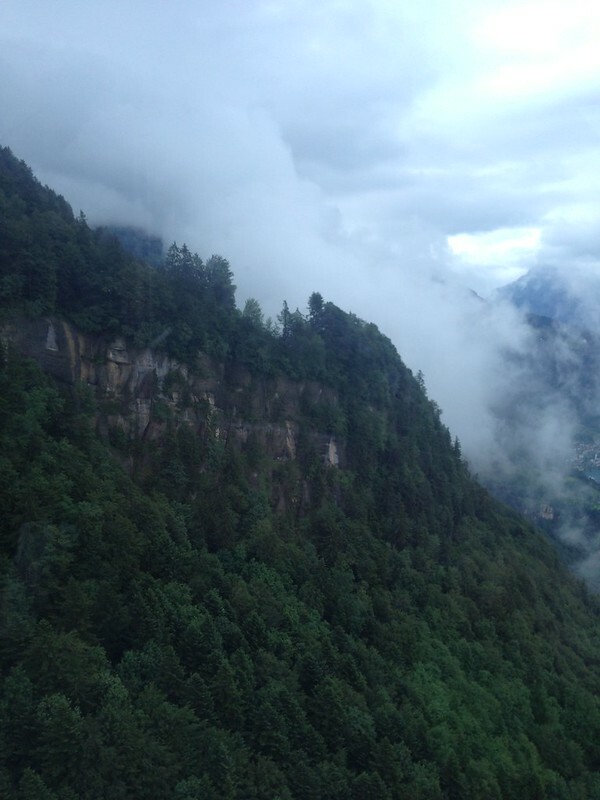 We then made our way to the gondola down to the town of Weggis (I believe). 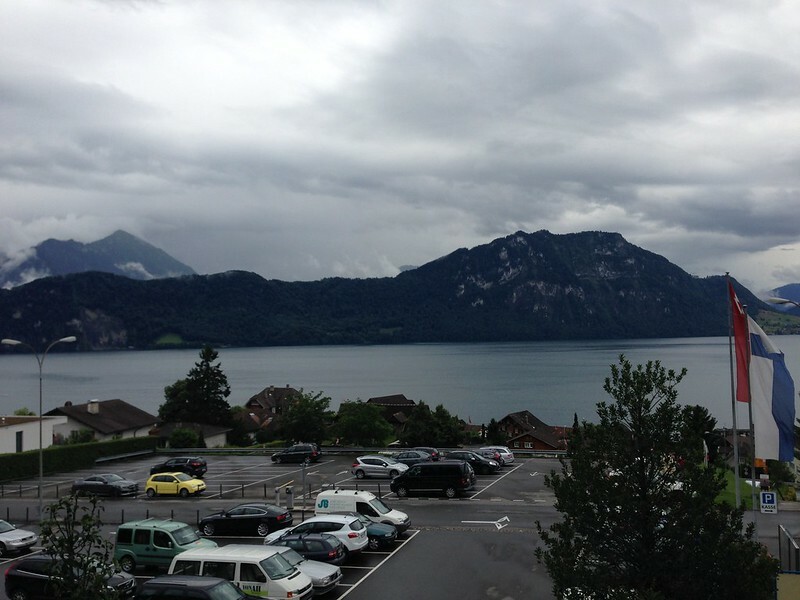 Once we were below cloud-level, we got some of our best views of the day with Lake Lucerne at the bottom (although the camera really didn’t capture them well). 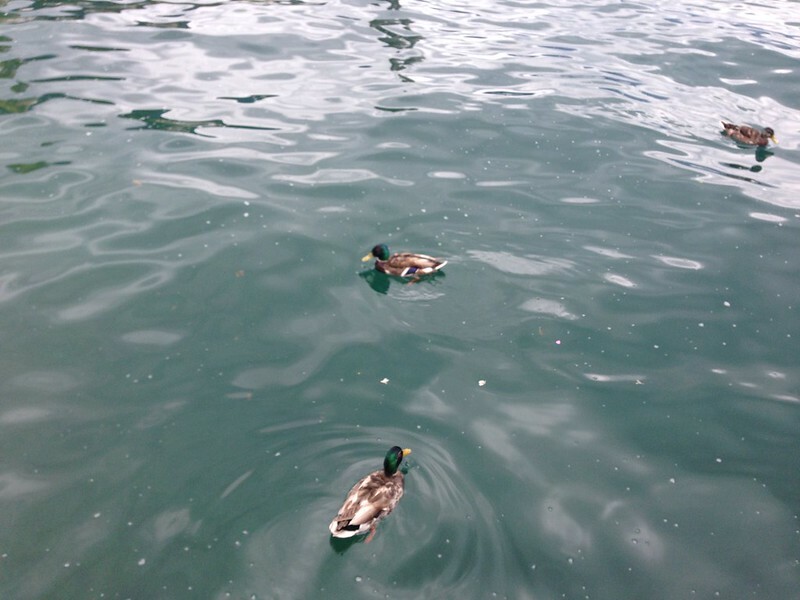 We knew that we had to take a boat back from here to Lucerne, but we didn’t know where to go exactly. Instead of asking for help, we just wandered through the small town, checking out the streets and shops until we made our way to the dock where we found out we had some time to kill till the next departure. My wife made some friends at the water’s edge. When it was time to board, we got on the boat and found the trip very pleasant. There was plenty of seating – mostly restaurant-style – with food and drinks being served. The views on the water were great - even caught a few glimpses of snow-capped mountain tops. 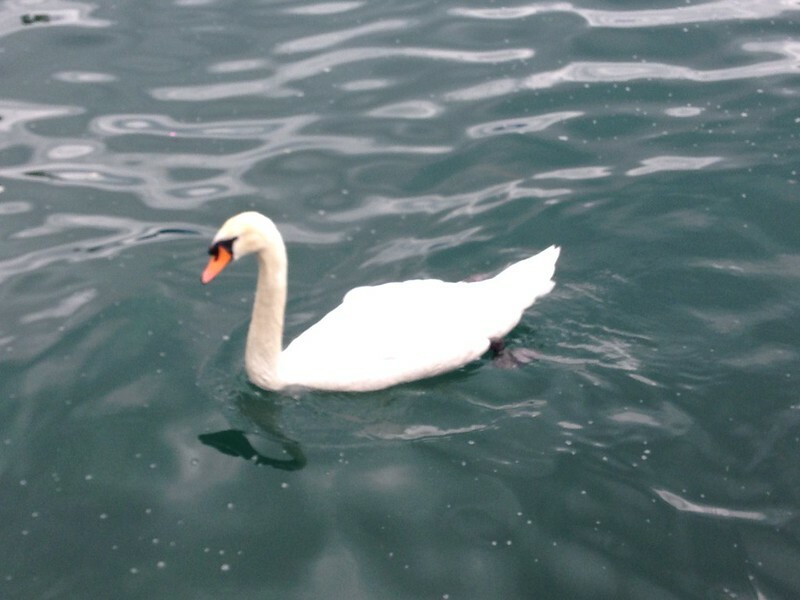 Within a half hour, we docked at Lucerne. Despite having heard that the city is very nice to walk through, we were getting tired, so we headed into the train station, which was conveniently right next to the dock. We took the train back to Zurich HB, picked up our stuff from the locker and got on a train for the airport. I had originally thought we’d go out to dinner (take advantage when there are Kosher restaurants! ), but the food we bought in the morning was enough, so we headed to the airport and made it for our 9:05PM flight to Rome. It was too late for the hotel shuttle, so we took a taxi for 35 euro to the Sheraton Golf Parco de' Medici, booked for 7K SPG. The hotel was pretty standard (although it had a golf course out back), and after scheduling the airport shuttle for the morning, we went to sleep. 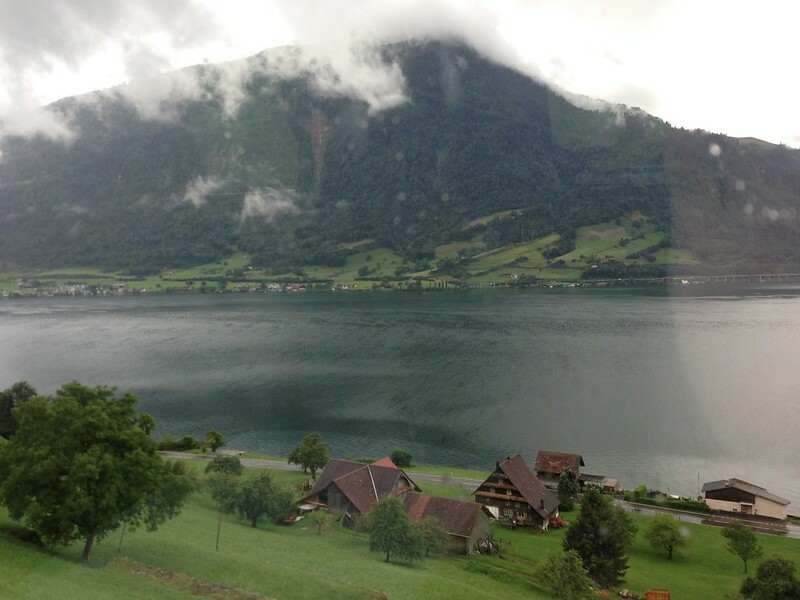 Despite the rain and cold weather, we had a great 23 hours and 55 minutes in Switzerland! Woohoo for getting another part out! lol, but great job @Yehuda for continuing this TR so long after the trip! May you will indeed finish it one day soon. oh boy! what an unexpected treat! thanks! Hehe, had some time today. Beautiful! How do you remember such detail from, what, more than a year ago? I can barely remember last week. Yep, although some days have much less than others. 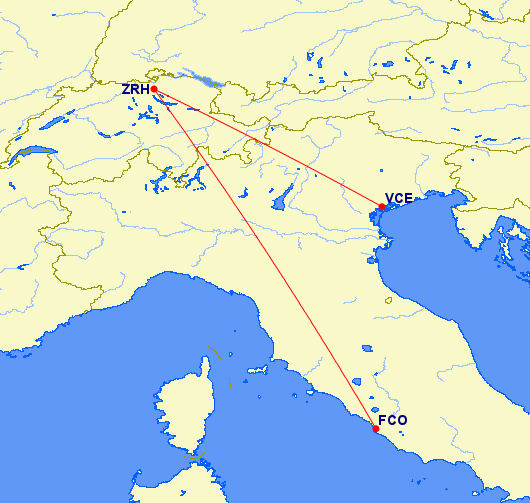 Interesting that you chose Mt Rigi over Pilatus. I still can't believe you refuse to invest $300 in a camera, but whatever.